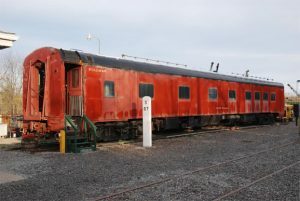 The faded red passenger car that lived on Track 2 at Industry for so many years has a history that includes serving passengers on first class limiteds and later serving drinks to commuters on Long Island’s east end. The car we know as the Pine Falls was built in 1939 by Pullman-Standard for use on the Pennsylvania Railroad. It saw regular assignments on first class trains throughout the system. Configured as a Pullman/Lounge, half of the car was built as sleeping car space with 6 double bedrooms, while the other half was configured as a buffet lounge. A small galley kitchen was located amidships, and was capable of producing beverages, sandwiches, and other light meals and snacks. An interesting feature in the lounge is a telephone set, which was an early implementation of a radio telephone that allowed passengers to make calls from the train! Our museum was lucky that most of the furnishings in the lounge car are original, with the exception of one or two pieces that cannot be traced. After providing years of service on the PRR, the Pine Falls was purchased by the Long Island Rail Road in October 1968 (interesting to note that the LIRR was a PRR subsidiary until it was purchased by the state in 1966). On Long Island, the car was known as Poquott, and was pressed into parlor car service on “east end” trains to Montauk and Greenport. According to one web site, it was retired in 1976 and sold to Naparano Iron & Metal in 1977. This conflicts with our assumed 1979 retirement date, evidenced by the NYS Liquor License on display in the kitchen, issued to LIRR. The Pine Falls languished in the scrap yard until Conrail engineer Don Jilson purchased the Pullman from Naparano in 1978. The car was first moved to Owego, then later to Flemingville in 1980 before it was finally moved up to the Ontario Midland. It sat there for many years before Jilson donated the car to the Rochester & Genesee Valley Railroad Museum in 1985. It arrived at Industry in 1986, and has been on display ever since as an example of prewar passenger car design. A number of efforts towards stabilizing the car were undertaken since its arrival at the museum. Several volunteers worked on the electrical system in the car, which allowed us to turn on most of the lights in the lounge and kitchen and some of the lights in the bedrooms. A window air conditioner was installed in the lounge, and the car was used for many Chapter meetings over the years. At various times a general cleansing was attempted to keep the car hospitable. However, the deterioration of the body from the inside proved to be overwhelming, and cosmetic restoration efforts stalled. In an effort to rebuild the yard tracks at Industry, it was decided to move the Pine Falls off Track 2 and up to our Restoration Building (which did not exist when the car first arrived). The Pine Falls will undergo a careful evaluation for possible future preservation efforts.